British composer and pianist Will Todd has worked at the Royal Opera House, the Lincoln Center in New York, London’s Barbican, and with Welsh National Opera, award-winning choirs The Sixteen, the BBC Singers, and Tenebrae. His music is valued for its melodic intensity and harmonic skill, which often incorporates jazz colours. We caught up with Will to ask him a few questions about his inspiration and approach to composition. So varied – and I love that! Could be anything from 8 hours in the composing shed at the end of my garden, to travelling in the UK or abroad to do performances, rehearsals, workshops or meetings, to cooking for the family, or doing admin and accounts… #nodayisthesame! If it’s a composing at home day, I try to be at my desk early and work till midday and I always start by playing something (anything!) on the piano. What do you like to do when you’re not composing? Films, cooking, reading, comedy, chatting. What is the most difficult piece you’ve ever written and why? Probably my Clarinet Concerto for Emma Johnson. It was a challenge to get the jazz elements she wanted integrated into a symphonic texture whilst keeping a good balance between clarinet and orchestra. Got there in the end though! What is the most exciting composition you’ve ever worked on and why? Very hard to answer—a definite highlight would be the 2012 commission for the Queen’s Diamond Jubilee Thanksgiving Service at St Pauls. I wrote The Call of Wisdom for the specially formed youth choir, and the whole thing was very exciting. Tell us about one of your proudest moments. Seeing my daughter on stage at ENO in a performance of Carmen! In my own music I was very proud of the fundraising Mass in Blue performance/workshop/singing day in 2015 in aid of Rainbow Trust where we raised £20,000. What is your inspiration/what motivates you to compose? I think the desire to have the music have a good effect on the listeners and performers—to create something magical. How do you prepare yourself to begin a new piece? I think a lot and play the piano a lot. But the text (if it’s a words piece) is one of the most important starting points. How do you begin to approach a new commission? I think about structure, and where it is being performed, and who is performing, before anything else. Do you treat your work as a 9-5 job, or compose when you feel inspired? Normally the former, but there are times when I have to rush out of the house to my composing shed to jot down an idea. What does success within a composition look like to you–how do you know when to stop editing a piece and that you’ve reached the end? I think, over time, you know when you have got a piece ‘right.’ It’s a hard balance to strike and it is easy to keep on fiddling with things; but in my experience, my first ideas are the best so I try not to change them too much. Which of your pieces holds the most significance to you? Mass in Blue has a lot of significance. Also Christus Est Stella. What or who has influenced you the most in your life as a composer? My mum made embroideries which were always hanging around the house in various stages of completion. This taught me so much about process. I also listened to a broad range of music in my childhood, from orchestral classics through to rock music and jazz. Nothing was off limits and that’s still the case. I love the operas of Puccini, the symphonies of Sibelius and Shostakovitch, and lots of choral music. Have the challenges you face as a composer changed over the course of your career? I think you feel the pressure of ‘the market’ more as you progress because you have a better understanding of what does and doesn’t work. What is the last piece of music you listened to? Didn’t We Almost Have It All by Whitney Houston. What might you have been if you weren’t a composer? In my dreams a cricketer! What made you want to be a composer? I think a general obsession with listening to music and trying to work out how to do it. Is there an instrument you wish you had learnt to play, and do you have a favourite work for that instrument? I love the trumpet and the music I love particularly is the jazz playing of people like Dizzy Gillespie and Miles Davis. Which pieces would appear on your desert island playlist? Mary’s Lullaby by John Rutter, Giacomo Puccini’s opera La Bohème, and Jean Sibelius’ 7th Symphony. How has your music changed throughout your career? I’m not sure I can tell; in general, it’s got shorter and better structured. I also don’t worry so much about what other people think. One in which I was performing Mass in Blue. Which composer, dead or alive, would you most like to meet? What’s your guilty pleasure listening? All of it! But particularly the Carpenters! Featured image: Cricketers on the Green by Junk151 via Pixabay. Will Todd has worked at the Royal Opera House, the Lincoln Center in New York, London's Barbican, and with Welsh National Opera, award-winning choirs The Sixteen, BBC Singers, and Tenebrae. He travels extensively world-wide, workshopping with choirs, and conducting performances of his works. Will's music is valued for its melodic intensity and harmonic skill, often incorporating jazz colours. 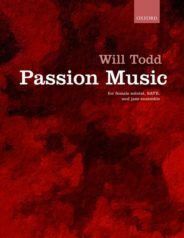 His latest jazz-inspired choral work, Passion Music, will be published in November 2018.